This executive series mid back leather desk chair from Boss Office Products is beautifully upholstered in genuine, Italian leather with a rich mahogany wood finish on the hardwood arms and leg caps. Other features include passive ergonomic seating with built-in lumbar support, upright locking position, adjustable tilt tension control, pneumatic gas lift seat height adjustment, tailored, leather padded arms and a 27" wood covered steel base with dual wheel hooded casters. Dimensions: Seat size: 21"W x 20.5"D. Back size: 21"W x 22.5"H. Seat height adjustment: 18.5-22"H. Fully warranted by Boss Office Products. 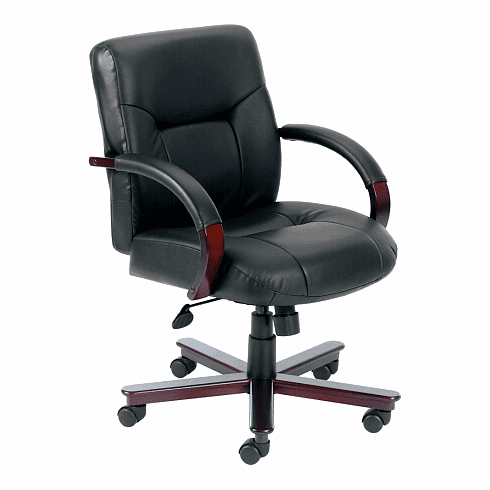 These mid back executive leather desk chairs normally ship within 2 business days from our GA or CA warehouse.